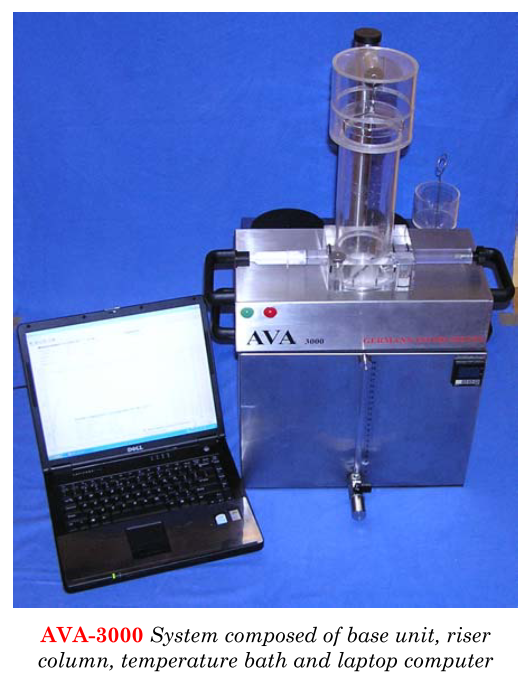 The AVA (Air Void Analyzer) is used to measure the air-void parameters (spacing factor and specific surface) of samples of fresh air-entrained concrete. Samples are taken after concrete has been placed in the structure and consolidated. 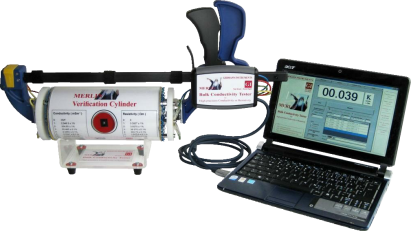 It provides timely information to reveal problems with the air-void system. 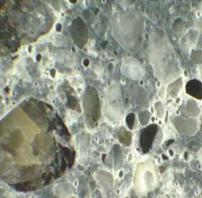 The durability of concrete subjected to wetting and cycles of freezing and thawing can be enhanced by deliberately introducing many, small and closely spaced air bubbles (air voids) in the cement paste. During freezing, the ice formed in the capillary pores of the paste will expand into adjacent air voids without damaging the paste, provided the air-void spacing and the size distribution of the air voids are within certain limits. The spacing factor (maximum distance from any point in the cement paste to an air-void boundary) and the specific surface (ratio of the surface area of the air voids to their volume) are two parameters that can be used to characterize the air-void system. In general, a good quality, frost resistant concrete requires a spacing factor less than 0.20 mm and a specific surface greater than 25 mm-1. 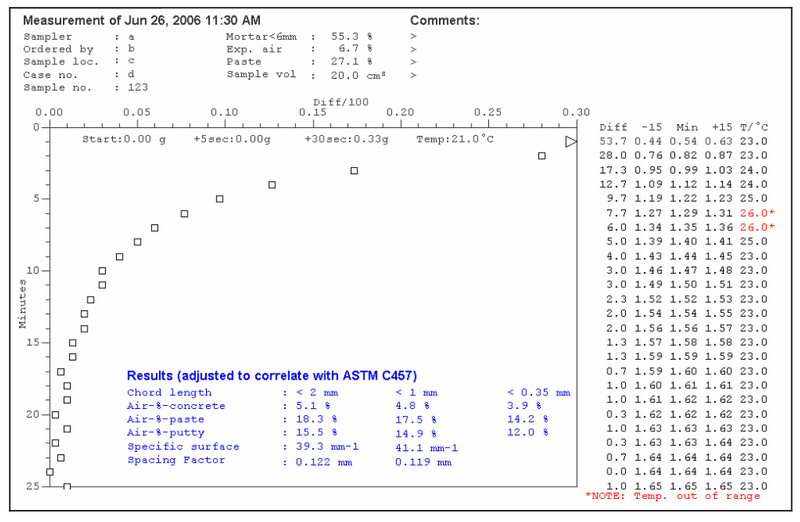 The spacing factor and the specific surface of the air-void system are determined typically according to ASTM C457 “Test Method for Microscopical Determination of Parameters of the Air-Void System in Hardened Concrete,” or similar standards such as EN 480-11 “Admixtures for concrete, mortar and grout – Test methods – Part 11: Determination of air void characteristics in hardened concrete.” These methods require obtaining a sample from the hardened concrete on-site and preparing a properly polished specimen in the laboratory as illustrated in the photo to the left. The spacing factor and the specific surface are then determined manually by the linear traverse method using a microscope, or by an automated image analyses system. Determination of the air-void structure in this manner cannot produce timely information during construction, which would be needed to make adjustments to the concrete mixture if the measured parameters are not within specified limits. Timely information is important, because practice has shown that the air-void structure created by air entraining agents can change easily during construction; for example, due to the type and dosage of normal or high-range water-reducing admixtures, by changes in sources of cementitious materials, by pressure influences during pumping of concrete, by high hydrostatic pressure, or by over vibration. With the AVA, the air-void structure is measured after the concrete is placed but while it is still fresh, thereby providing timely information of the spacing factor and the specific surface of the airvoid system of the in-place concrete. The testing time is 25 minutes or less. The air bubbles entrained in a mortar sample, which is obtained from fresh concrete with a special sampling tool, escape into a blue AVA release liquid as the mortar is stirred. Provided the release liquid has the proper viscosity and hydrophilic character, the bubbles released from the mortar retain their original size and neither coalesce nor disintegrate into smaller bubbles. Above the blue AVA release liquid there is a column of water through which the air bubbles rise. According to Stoke´s Law, larger bubbles will rise faster than smaller bubbles. 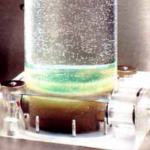 The air bubbles rising through the water column are collected under an inverted and submerged petri dish (buoyancy pan) attached to a sensitive balance. As air bubbles accumulate in the dishan, the apparent mass of the dish decreases as water is displaced by air. The apparent mass of the dish is recorded as a function of time. 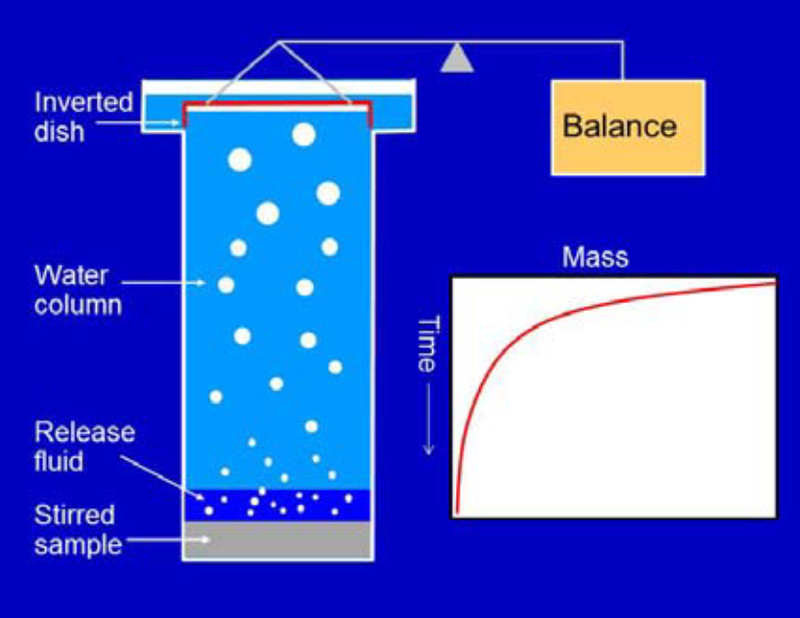 Based on the recorded change in apparent mass of the pan, an algorithm calculates the size distribution of the collected air bubbles. From the size distribution, the spacing factor and the specific surface are calculated. The algorithm ensures the parameters are similar to obtained from ASTM C457 linear traverse measurements. 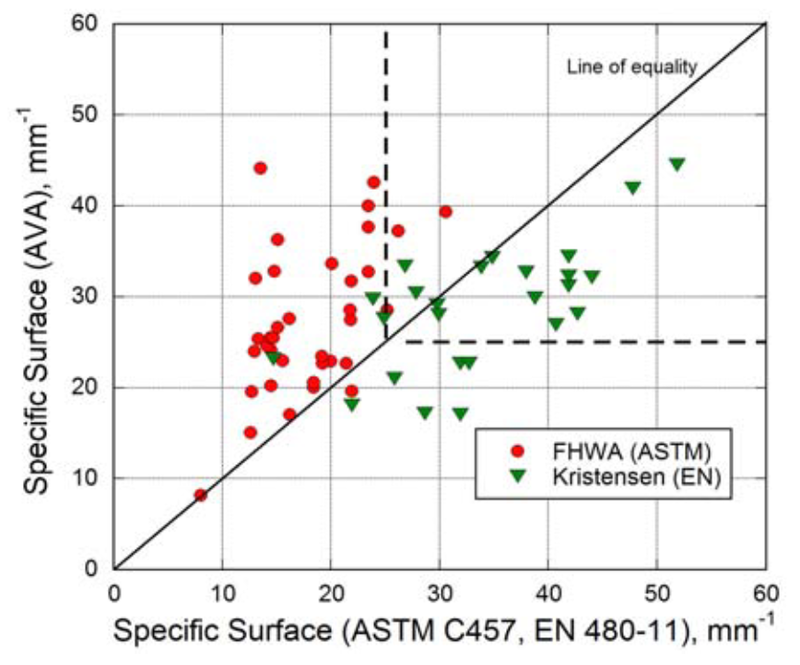 The results from the AVA have been correlated to ASTM C457 and EN 480-11 determinations. 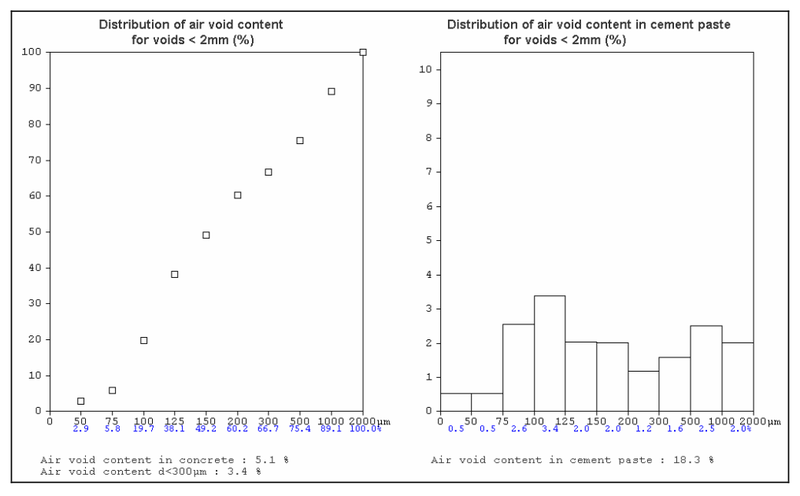 For example, the figures below compare air-void parameters obtained on fresh concrete samples using the AVA with the corresponding parameters obtained by microscopical analysis of the hardened concrete. ACI 201.2R, “Guide to Durable Concrete,” recommends that for resistance to freezing and thawing the spacing factor should not exceed 0.2 mm and specific surface should not be less the 25 mm-1. 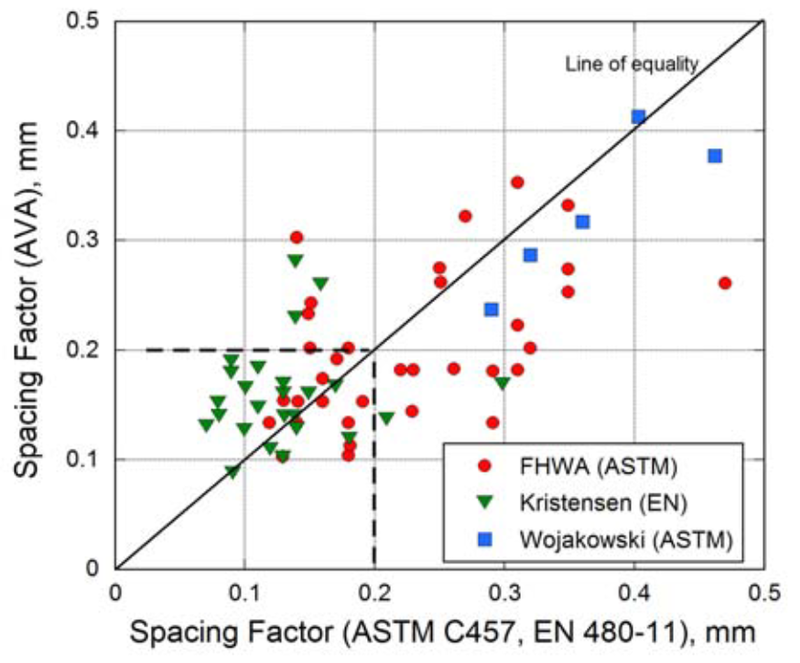 The plot on the left shows that for spacing factors below the critical value of 0.2 mm, the AVA values are on average slightly larger than from microscopical analysis, which is conservative. The plot on the right shows that for specific surface greater than the critical value of 25 mm-1, the AVA values are on average smaller, which is also conservative. The single-operator coefficients of variation for the AVA spacing factor and the specific surface determinations are 8 to 10 %. 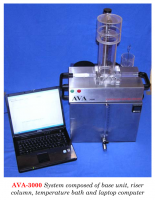 In 2008, AASHTO adopted a provisional test method for the AVA: “Method of Test for Air-Void Characteristics of Freshly Mixed Concrete by Buoyancy Change,”AASHTO TP 75-08. A sample of the mortar fraction of the air-entrained concrete is taken by vibrating a wire cage into the fresh concrete (left above). The mortar enters the cage, which excludes particles larger than 6 mm. 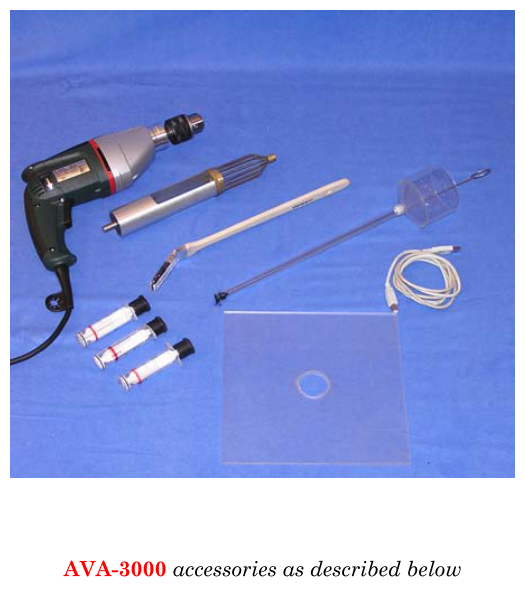 A syringe is used to collect a 20 mL mortar specimen from within the cage. The specimen is injected into the riser column (center-left above). The riser column has the blue AVA release liquid at the bottom and water above it. The mortar and the liquid are stirred gently by a magnetic stirrer for 30 seconds, and the air voids are released (center-right above). 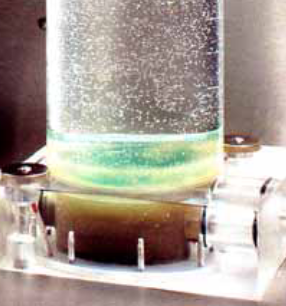 The bubbles rise through the liquids at rates that depend on their size, which results in a separation in time when different size bubbles arrive at the top of the column. The bubbles are collected under a submerged and inverted glass dish attached to a balance (right above). A computer connected to the balance records the change in mass of the inverted dish as a function of time. In the early stages of the measurement, the size distribution of the air bubbles collecting under the dish range from a few mm to a few micrometers. For each succeeding period, the size of the bubbles that collect under the dish decreases. minutes, in which case the measurement is stopped. The AVA software processes the time history of the balance readings and calculates the air- void parameters including spacing factor and specific surface, as shown on the following page. In addition, the software produces a graph of the bubble size distribution and a histogram of the different bubble sizes, also illustrated on the following pages. Two AVA-3000 is a second-generation system that improves on the first system that was based on the original Dansk Beton Teknik (DBT) design from the late 1980s. Laptop computer with AVA-3000 software. A histogram of air-void sizes less than 2 mm (right). 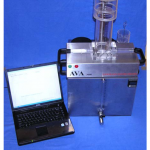 The AVA-3240 release liquid comes in 5-L containers with controlled batch number and certificate that it has the proper viscosity and hydrophilic characteristics. 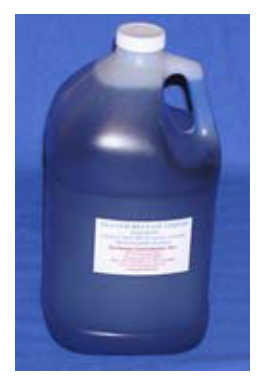 Each test requires 200 mL of liquid. 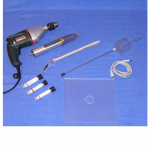 Delivered separately is the AVA-3260 verification kit (calibrated masses applied to weighing rod). Offered separately is a one-day training course by an AVA specialist.